Note: Race extended four laps past its scheduled 400-lap distance due to a green-white-checkered finish. Clint Bowyer started fifth and finished fourth to earn seven bonus points. Held the fifth position during the first half of the stage and was the fastest car on the track on lap 48. Moved up to fourth on lap 69 before pitting for four tires and fuel. Reported his VF-1/Rush Truck Centers Ford was “too heavy on the nose, making it too tight center off” following the stop. Battled Kyle Busch for third during the final five laps of the stage but ultimately finished fourth. Bowyer started third and finished secondto earn nine bonus points. Team made minor wedge adjustment to loosen the car up before the stage began. Bowyer turned the fastest laps early in the stage and took second from Joey Logano on lap 157. Reported the car being tight, but he was closing on leader Kevin Harvick on lap 188. Crew chief Mike Bugarewiczcalled for right-side air pressure adjustment during a green-flag stop on lap 190. Bowyer reported the car was extremely tight after pitting and said the “front end needs to turn better,” but his lap times were extremely fast. Closed to the bumper of leader Harvick several times late in the stage but couldn’t make a move for the lead. Bowyer started thirdand finished 35th. He continued to be one of the fastest cars on the track during the early laps of the final stage. Pitted following a caution on lap 339 and restarted third. Reported a loose wheel on lap 377 and pitted on lap 381 for right-side tires. His race ended on lap 388 when his racecar’s right rear gave way, causing the No. 14 VF-1/Rush Truck Centers Ford Fusion to contact the turn-four wall and come to a stop on the inside guardrail. 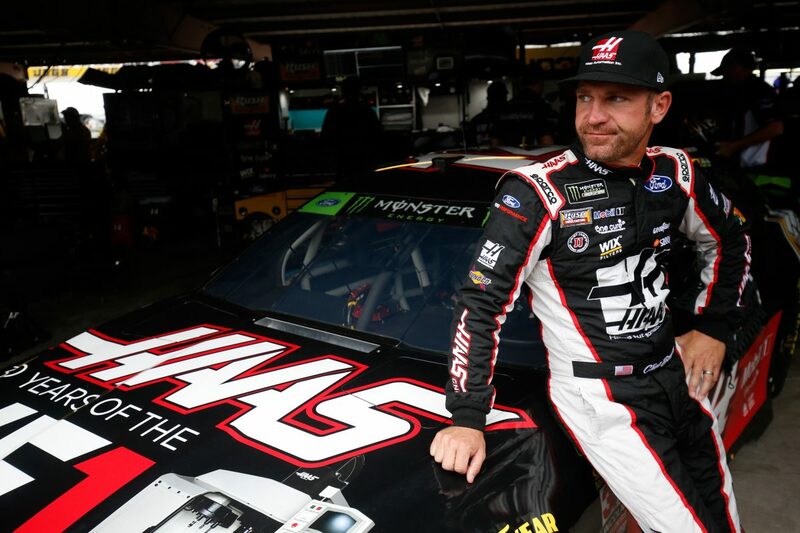 Bowyer finished fourth in Stage 1 to earn seven bonus points and second in Stage 2 to earn an additional nine bonus points. Bowyer led one lap to increase his laps-led total at Dover to 83. This was Bowyer’s first DNF (Did Not Finish) in 26 career Monster Energy NASCAR Cup Series starts at Dover. All four SHR drivers finished in the top-10 in Stage 1 and again in Stage 2. Chase Elliott won the Gander Outdoors 400 to score his second career Monster Energy NASCAR Cup Series victory, his second of the season and his first at Dover. His margin of victory over second-place Denny Hamlin was .265 of a second. There were five caution periods for a total of 31 laps. Only 15 of the 39 drivers in the Gander Outdoors 400 finished on the lead lap. The next event on the Monster Energy NASCAR Cup Series schedule is the 1000Bulbs.com 500 on Sunday, Oct. 14 at Talladega (Ala.) Superspeedway. It is the fifth race of the 10-race playoffs and the second race in the Round of 12. It starts at 2 p.m. EDT with live coverage on NBC. Pre-race coverage on NBCSN begins at noon with NASCAR Americafollowed by Countdown to Greenat 1 p.m.